A quilt holds the secret to a killer still at large---and who his next victim will be. Following an attack that killed her mother and stole her ability to speak, 21-year-old Sophia Montgomery has no choice but to accept her estranged grandmother's offer to return to their family home. Although detective Julian Frazier is working hard on the case, Sophia unknowingly frustrates him because her inability to speak thwarts her eyewitness evidence. The fact that Julian is undeniably attracted to Sophia doesn't help either, so Julian hides his feelings as concern for a trauma victim and focuses instead on finding the killer. Little do they know, the clues to solving the case may be right in front of them, displayed in Sophia's mother's "special" quilt design. Who will realize the secret Sophia's unwittingly been hiding in plain sight? When the truth comes to light, will Sophia find her voice again? Or will the murderer---still at large---silence her forever? 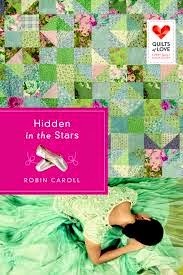 Don't miss the newest Quilts of Love book, Hidden in the Stars by Robin Caroll. September's QOL release is a wonderful combination of mystery, romance, and family love bound together by a quilt and the story it tells. Enter to win a "Night on the Town" (a $200 Visa cash card!) and RSVP for the "Fall into Fall" Quilts of Love Facebook party on 10/7. Enter today by clicking one of the icons below. But hurry, the giveaway ends on October 7. Winner will be announced at the October 7th author chat party with Amber Stockton and Robin Caroll! RSVP for an evening of book chat, quilting tips and tricks, prizes, and more! RSVP today and spread the word—tell your friends about the giveaway via FACEBOOK or TWITTER and increase your chances of winning. Hope to see you on October 7th! I couldn't put this book down. I tossed it into my backpack on errand day, knowing I would bit sitting around during oil changes and tire changes. Once I started reading it, I actually wished these things took longer than they did! Sophia's strength during such a horrible time drew me in and the way that Julian and Charlie come to her aid, far beyond what their job entailed, made me feel a spark of hope for humanity. Even if you're not a fan of quilting, I can't see how you can't be a fan of this book.